This fourth edition of Immunization Handbook for Pharmacists (previously titled APhA’s Immunization Handbook) provides practical and timely updates for pharmacists and pharmacy staff who are involved in pharmacy-based immunization services. Updated throughout, the 20 chapters present a step-by-step process for developing and implementing immunization services. As policies and laws related to vaccination change, pharmacists have increased opportunities to educate and vaccinate persons in their community. And with changes in available vaccines, immunization schedules, and dosing and administration recommendations, immunizing pharmacists have a responsibility to stay informed. 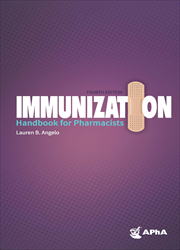 This fourth edition of Immunization Handbook for Pharmacists (previously titled APhA’s Immunization Handbook) provides practical and timely updates for pharmacists and pharmacy staff who are involved in pharmacy-based immunization services. Updated throughout, the 20 chapters present a step-by-step process for developing and implementing immunization services.